Richard Morin said, This MoU provides the framework to continue and formalize the very constructive discussions QFC & PSX have had in the past few months and lead to concrete collaboration initiatives. Collaboration between our two organisations will not only benefit our two countries’ respective financial sectors but it will also help facilitate and support bi-lateral investments in other sectors. 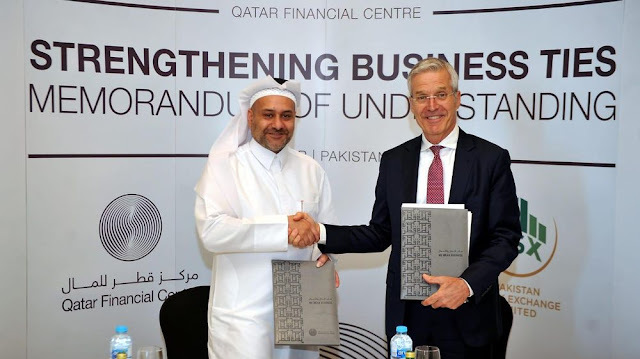 Yousuf Mohamed Al-Jaida, Chief Executive Officer, QFC Authority, said: We are confident that this important MoU with the Pakistan Stock Exchange will facilitate an even greater level of cooperation between the two countries. Pakistan is one of the key markets targeted by QFC’s recently announced strategy, and an integral part of our New Emerging Belt Initiative, and this agreement will further bolster our commitment to this vital market. Al-Jaida added: Pakistan Stock Exchange is an esteemed institution, and is amongst one of the world’s greatest performing stock markets – which is an indicator of course of the incredible growth and opportunities that are abundant in Pakistan’s markets. We look forward to the great accomplishments that will result from this partnership.